GARDENING REQUIRES many leaps of faith, especially when you’re learning on the fly as I am (but then again, I suspect that’s what most gardeners do throughout their lives). This morning I took a giant leap, with Dong’s help. He arrived at 8AM, chain saw in hand. I was still in my pajamas, but no matter. This is the country. I went outside. 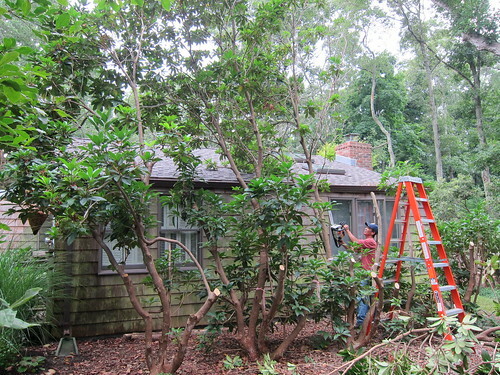 He was here to radically prune five overgrown rhododendrons that have towered over my East Hampton cottage since I bought it in May of ’09. Those rhodies bloom magnificently purple in mid-May, but 20 feet up, way over the roofline. I never really got to enjoy the flowers. And though they sheltered the house and I enjoyed the sense of seclusion they provided, two close friends who are professional garden designers agreed they ought to be hacked back, both for appearance sake and the health of the shrubs. So when Mary-Liz visited two weeks ago, she got out her pink marking tape and, at my request, thoughtfully tied ribbons around each branch just where they should be cut. I could never have made those decisions myself. Finally, this morning, Dong arrived to do the job. I held my breath. He buzzed his way through the five rhodies (Mary-Liz had suggested possibly leaving one large near the house, but when the other four were down, I thought it better to make them all uniform.) The operation was over before 9. Suddenly the area feels bare. The side of the house is exposed in all its discolored cedar shingle glory. I looked at some nearby shade plants, like the pulmonaria under the magnolia, and thought, it’s not gonna be happy. Other things, however, probably will be very happy for the extra sun. Am I happy? I’m afraid to go out and look again. But as Dong said, “Don’t worry. Next year it will all fill in.” Let us pray. This entry was posted in GARDENS & GARDENING, HAMPTONS, LONG ISLAND and tagged chain saw, cottage, East Hampton, prune, pruning, radical, Rejuvenation, rhodies, rhododendrons, rhodos, Springs. Bookmark the permalink. This is a good thing you did. Begone: the scourge of leggy bushes! They are concealing great houses and blocking great light all over the land. And you know, they don’t look pretty. 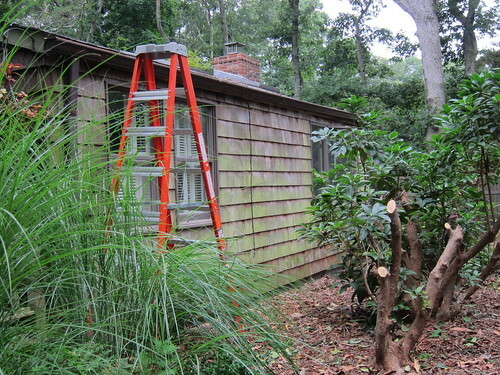 It takes professionals to make overgrown look good. OMG!!! I’m jealous that you were fortunate enough to have such lusciously healthy and vigorous Rhododendrons, growing to perfection as Nature intended. One should always follow one’s heart when gardening, never another’s advice. Quick thought…if you’d merely wanted some blooms closer to eye level, why didn’t you just plant a few young shrubs in front of these (formerly) magnificent beauties? Thanks for your comments, Jeanne & Anon. I do believe that the payoff will be worth it. Planting more shrubs in that area wouldn’t have worked because a) there’s a path there I want to keep clear, and b) they would have been totally shaded out by those gargantuan rhodies! I think you’ll really enjoy your bushes next year! I did that to some wax leaf hedges and they grew in nicely. We also cut down a tree due to hurricane damage and thought I would never get over missing that tree…however, I’m loving the area now because now I have tomatos growing where there were none before. hi Jean, welcome. Don’t think I’ve heard from you before. It can never be bad to get more light and air into a generally shady garden, but it can have surprising results. I had a few big trees taken down in my backyard. The following spring I had a fantastic crop of snowdrops, which benefited from the new sun, but my May Apples (which love shade) didn’t come up at all!